An automatic ingredient bread batching system can be used in the production of a variety of organic breads. In this application example an 8 bin minor ingredient system is used. The customer desired to create each bread batch in a tote. The system consists of 8 stainless steel storage bins and augers, an industrial TEFC electric motor for each feeder, stainless steel frame supporting the bins, a 5 section conveyor system (in-feed conveyor, scale 1 conveyor, scale 2 conveyor, scale 3 conveyor, and exit conveyor), stairway, walkway, and pallet stand. Also included are a scissor lift and a pneumatic bag hoist. Sterling Systems & Controls also supplied all electrical controls and automation for this bread batching system. Therefore, the system included two (2) control panels: Motor Starter Panel and PLC/Operator Interface Panel. Both panels are rated NEMA 4X and are of Stainless Steel construction. All VFDs (variable frequency drives), contactors, and the PLC processor will be Allen Bradley. Four (4) weight instruments are installed and preconfigured for Ethernet/IP communications on the PLC/Operator Interface Panel. 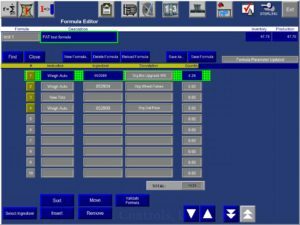 The controlling software for this bread batching system is Sterling Systems & Controls customized Rockwell Software FactoryTalk View ME running on a PanelView+ Touchscreen HMI in the PLC/Operator Interface Panel, where formulas and ingredients are created and scheduled to batch. Up to 25 formulas containing up to 75 ingredients each are able to be stored simultaneously in the PLC. In this case, the bread batching system consists of both an automatic and a semi-automatic (operator made weighments) batching process. The automatic process automatically dispenses ingredients from eight supply bins into containers. The containers are indexed under the discharge point of the feeding devices. The semi-automatic process will prompt an operator to hand add ingredients into a container on a platform scale. The automatic and semi-automatic batching processes run simultaneously, working on the same batch. Both processes are controlled from the PanelView+ HMI on the PLC/Operator Interface Panel. 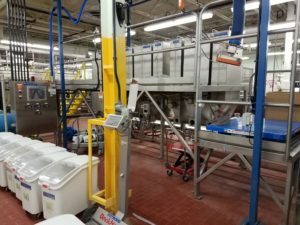 How the Automatic Minor Ingredient Batching Process Works: The automatic bread batching system will dispense ingredients according to a predetermined formula into totes. Each tote is 13” x 22” x 8.5”. A supervisor will determine the number of totes that are required based upon the batch formula. The operator manually places the totes onto the inlet of the In-feed Conveyor (conveyor section 1 of 5). There is a “container-in-place” optical sensor on the In-feed Conveyor. An alarm is initiated if a new tote is required, but none is sensed. 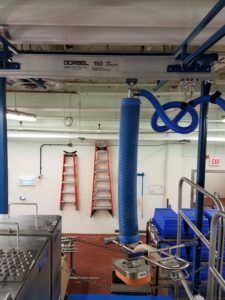 When a tote is required at the Scale #1 position (on conveyor section 2 of 5), the system automatically feeds the tote from the in-feed conveyor onto the Scale #1 Conveyor. If a tote is required on the Scale #2 Conveyor, and the tote has finished at the Scale #1 station, then the system indexes the tote onto the Scale #2 Conveyor (conveyor section 3 of 5). If a tote is required at the Scale #3 Conveyor (section 4 of 5), the system indexes the tote in the same manner. Once a tote has finished at all of the first three scale stations, it is indexed onto the Exit Conveyor (section 5 of 5). Several Fixed Field Tote Sensors are located throughout the conveyor system to determine if the totes are in the correct position for loading, conveying, and indexing. The screen prompt will request that a container be placed on the hand-add platform scale for tarring. Once the container is detected on the scale, the system will turn on the lighted “Continue” push-button and after the operator presses the button, the system acquires a tare weight. The system then prompts the operator to add the programmed amount of the first hand-add ingredient in the formula. The system will display the required weight and will allow the operator to weigh the ingredient into the container. Once the system detects that the amount added to the scale is within the programmable over and under weights, it turns on the “Continue” lighted push-button. The Operator presses the push-button and the system repeats steps 2-3 for each Hand-Add ingredient in the formula. If an ingredient is encountered which has a “Bag Size” other than zero specified in the Ingredients Screen, the system prompts the operator to pick the appropriate number of whole bags and then prompts the operator to weigh the remaining “odd” weight. For example, if an ingredient target weight is 122lbs and the ingredient Bag Size is 50lbs, the system will first ask the operator to pick and confirm they have two (2) full bags of ingredient, and then will prompt the operator to weigh the remaining 22lbs into the container on the platform scale. Full bags are not weighed and are not placed on the Platform Scale. It is also possible that if this ingredient is also present in an Automatic Bin, the formula can be written with a “Hand-Add” instruction for 100lbs and a “Weigh” instruction for 22lbs of the same ingredient. 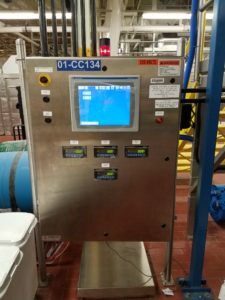 This causes the Manual System to prompt the operator to pick two (2) whole bags, but will weigh the remaining 22lbs automatically on the Automatic Batching System. 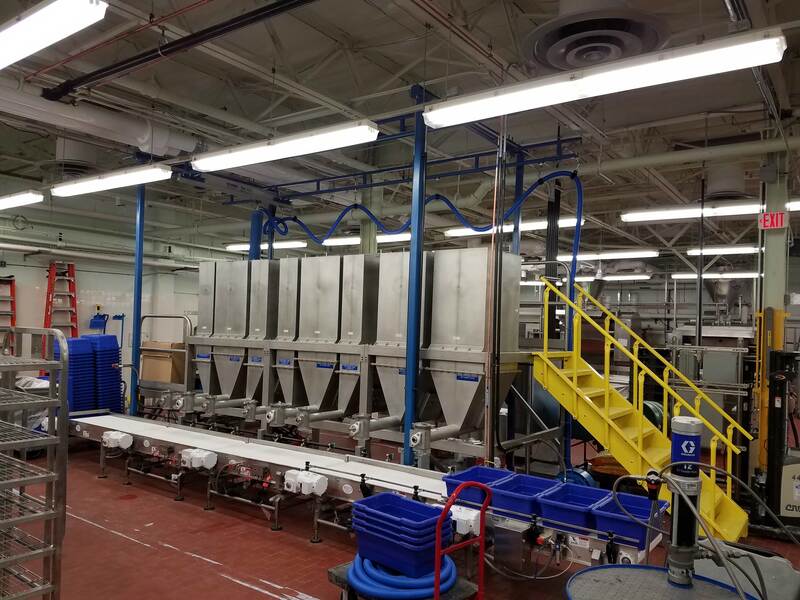 Once all the hand-add ingredients have been weighed, the operator is responsible for placing the picked bags and completed totes together with any totes created by the Automatic system for each batch to send to the mixing area. Once the first batch is complete, system will start the next batch and repeat the process. 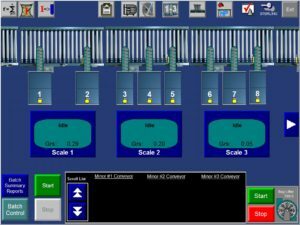 Access to the various functions and features of the control system application are controlled by one of four predefined security levels; Operator, Leader, Maintenance and Supervisor . The current security level is always displayed in the top right corner of the screen under the Security Button on the Main Toolbar. The status of each piece of equipment is indicated on the screen by color. If the equipment is running in the automatic bread batching mode, it will be light green. If it is turned off, it will be dark gray. If it is running in manual mode, or if the system determines that the equipment is running but the control system is not requesting it to run, the equipment will be light blue. If the equipment is faulted, it will flash red to white. If the equipment is idle in automatic mode, it will be a sea foam color. Setup of the ingredients, formulas, and alarm handling are done through their respective screens. Each ingredient bread batching system is customized to meet the exact requirements of our customer.